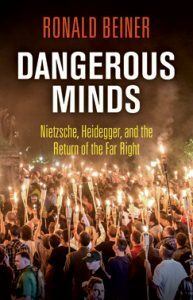 In Dangerous Minds, Ronald Beiner traces the deepest philosophical roots of such right-wing ideologues as Richard Spencer, Aleksandr Dugin, and Steve Bannon, to the writings of Nietzsche and Heidegger—and specifically to the aspects of their thought that express revulsion for the liberal-democratic view of life. Beiner contends that Nietzsche’s hatred and critique of bourgeois, egalitarian societies has engendered new disciples on the populist right who threaten to overturn the modern liberal consensus. Heidegger, no less than Nietzsche, thoroughly rejected the moral and political values that arose during the Enlightenment and came to power in the wake of the French Revolution. Understanding Heideggerian dissatisfaction with modernity, and how it functions as a philosophical magnet for those most profoundly alienated from the reigning liberal-democratic order, Beiner argues, will give us insight into the recent and unexpected return of the far right.